I clearly jinxed myself, gleefully bragging about how the final pieces were all falling into place for our move. Naturally, things didn’t work out quite as planned. In the middle of the night, we were forced to hastily start making alternate plans. First, let me tell you how wonderfully the day was going. I collected the money for the sale of our car, and signed over the title to the new owner. 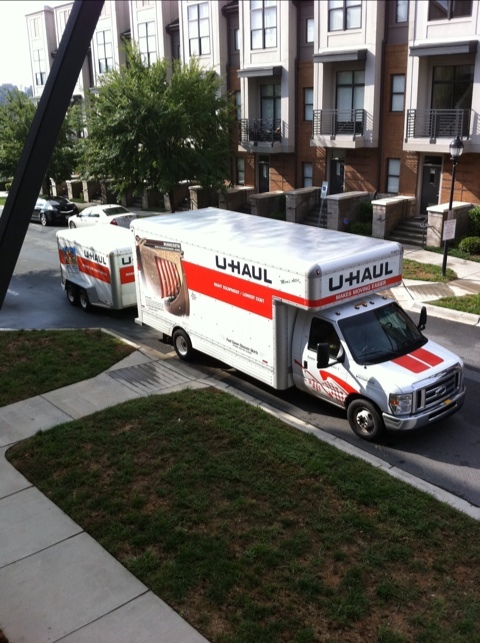 We picked up the U-Haul and were delighted by how much space it would hold. And several friends showed up to help us run errands, finish bubble-wrapping and boxing, and load up the rental truck. Unfortunately, by around midnight we started realizing that there was no way we’d fit everything we wanted to bring. We started performing furniture triage, figuring out what would have to be thrown away. I was relieved and more than a little surprised, frankly, because I’d assumed that he was in “damn the torpedoes, full speed ahead!” mode and wouldn’t accept any delays. Fortunately he was much more flexible about our plans than I’d realized. So Plan B was hatched. We’d be waiting at the U-Haul store when they opened at 7:00 on Tuesday morning, and we’d get a trailer to take all of the stuff that wouldn’t fit in the truck. It would mean that we wouldn’t get in to our new apartment until mid-evening, but we’d survive a few hours of delay. Turned out we got a slightly later start than Plan B called for — shampooing the bedroom carpet and loading everything up took longer than expected. Apparently things don’t go according to plan even when it’s a backup plan! Finally, at 10:00 on the morning of September 27th, I locked the door to our home in Charlotte and we headed north towards our new home in New York City. This entry was posted on Tuesday, September 27th, 2011 at 6:24 pm and is filed under Uncategorized. You can follow any responses to this entry through the RSS 2.0 feed. You can leave a response, or trackback from your own site.